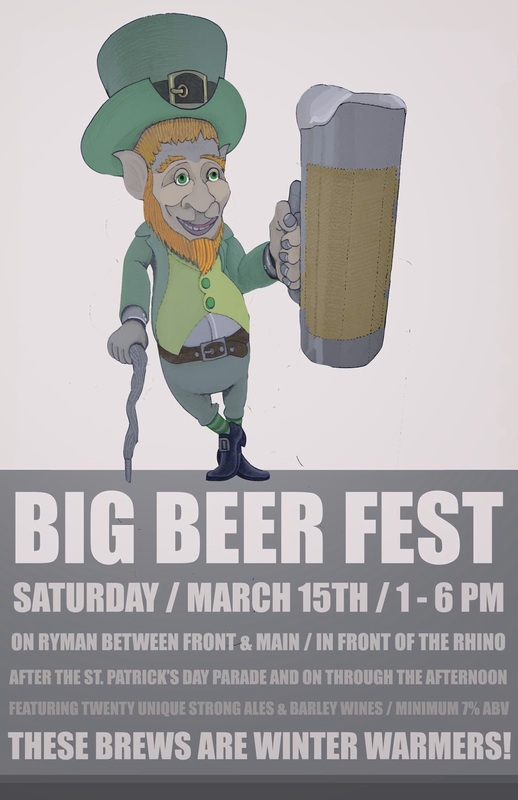 This Saturday March 15, The Rhino in Missoula, Montana, will host its first Big Beer Fest immediately following the St. Patrick's Day Parade downtown. Special for the event, The Rhino will close down Ryman Street in front of the bar and serve up some BIG BEERS, meaning that they will all be over 7% ABV (actually, half of them are over 10% ABV!). "This is the time to do it," says Kevin Head, owner of The Rhino. "It's not too warm yet and it will be fun to have something right after the parade. If someone needs something on the lighter side, all they need do is come inside where we have our full lineup of beers and drinks." Yes, The Rhino is well known for its 50 beer taps! It is free to attend the Big Beer Fest, but if you want to try something you must be at least 21 years of age, and 7 oz. pours will run $3. We did the math and it's the same price as other brewfests (instead of $12 for a glass and two tokens + three additional tokens, $15 will get you five pours at The Rhino's event). The event runs 1 - 6 p.m. Rumor has it that a Deschutes Abyss and Tamarack's Old Stache Barrel Aged Porter are waiting in the wings if they are needed.